Since its inception in 2009, the project has grown substantially, from a team of three people working in one village, to a team of over 60 people working at a landscape scale across 21 different villages as well as the Park and Wildlife Management Areas. The project initially focused on conflict data collection, but now has 12 major programmes and conducts extensive conflict mitigation activities, with a particular focus on developing community-level benefits from wildlife presence. As expected, the budget has also grown significantly over time – while the 2009 budget was around US$40,000, the project now costs approximately US$350,000 per year to run. The project has been increasingly successful in receiving multi-year funding commitments, and has increased its donor base at all levels. Over time, we have also used unrestricted gifts to develop a reserve in order to protect against an unexpected shortfall in funding or for sudden emergencies. The project is fully audited through the University of Oxford, which has a charitable status in the UK, as well as a 501(c)3 status in the US through Americans for Oxford. 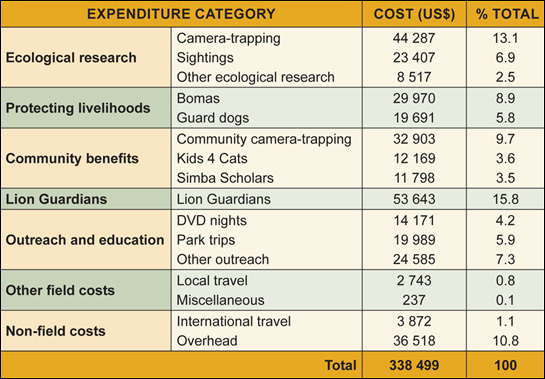 100% of all donations go to the Ruaha Carnivore Project, and 90% of all expenditure in the field goes on direct conservation activities.